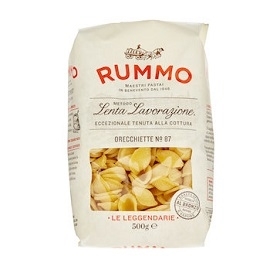 From that moment, Rummo have selected only the best durum wheat that nature has to offer, the only ones able to ensure Rummo pasta has the right protein content. Rummo pasta is only made with the purest water from the Sannio valley. The Lenta Lavorazione (slowly crafted) method comes directly from the traditional and artisan way of making pasta. Careful research into the best ingredients, handled with care and without hurrying, respecting their needs and characteristics and following the rhythm of nature. Thanks to the Lenta Lavorazione method and the care taken by our pasta makers, Rummo pasta is now certified for holding its shape when cooked and for the quality of the flours used. The result is a pasta which is guaranteed to hold its shape and texture when cooked for the right time.